Delta state, Nigeria is a state with the big heart i.e. a generous and welcoming state. The slogan of the state says as much. It is also the second largest oil producing state in Nigeria as attested by the Governor, His Excellency Dr Emmanuel Uduaghan in a recent stakeholders meeting of PDP Delta Central Senatorial District held in Warri. Hence by the existing revenue derivation arrangement of the Nigerian government, where crude oil producing states receive extra thirteen percent revenue derived from crude oil sales, Delta state can be considered economically healthy within the Nigerian context. Infact the erstwhile Finance minister of Nigeria, Dr Ngozi Okonjo-Iweala once described Delta state as richer than some African countries. Besides crude oil, the state is equally blessed with other revenue sources notably agriculture. It could also be described as the food basket of Nigeria. The second website above details the net statutory allocation derived by Delta state in March 2009 from the federation account. (This is the latest published figure as at the time of writing this article). Please compare with other non-crude oil producing states. The Governor Uduaghan led government has embarked on some laudable projects especially when compared to his predecessor, James Ibori. Some of the projects include the on-going construction of Asaba International Airport, Ogheye Ultra Modern Concrete Floating Market Project, Enerhen – Udu road dualisation and the construction of a gas processing plant in Oto-orogu to name a few. But more needs to be done. That more that needs to be done is the seeming neglect of Agbor town, the headquarters of Ika South Local Government Area and a principal town in Delta state in particular and Nigeria in general. Agbor seems to have been forgotten by the Governor Uduaghan administration in extending the dividends of democracy. Hence the title of this article. This article is primarily an open invitation for Governor Uduaghan to visit Agbor and see things for himself. For starters, the road network in Agbor is pathetic to say the least as a ride on Obi Ikechukwu road, Old Lagos – Asaba road and Charles Street to name a few will attest. Pipe-borne water is non-existent with privately operated boreholes replacing government responsibility for such a well-endowed state. Health-care delivery is pathetic but most worrisome considering that his Excellency is a medical doctor. Patients are left at the mercy of private health-care providers. This is fine by those who can afford it but what about the less privileged. 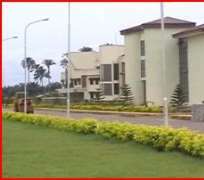 Pictured below is a side view of Delta State University Hospital, Oghara in Delta Central Senatorial District. Nowhere in Ika land can boast of such a government owned structure. His Excellency, this writer believes that the essence of good governance is taking care of the citizenry across board. What is good for one should be good for all. Education is equally neglected in Agbor land as can be seen by the run-down structures that pose as educational establishments; please visit Ika Grammar School and College of Education, Agbor. Your government has been good in providing affordable housing to some parts of the state but again Agbor seems forgotten in this regard. The good people of Agbor equally deserve affordable housing. The program of a governor and especially the governor of a challenging state like Delta can be quite hectic and more often than not, a governor may have to depend on the advice of his lieutenants to move the state forward. Your government has a considerable number of top lieutenants of Agbor and Ika extractions in well placed positions to advice and guide you as to the needs of Agbor people in particular and Ika people in general. It appears that they are not guiding you properly. Thus, your Excellency, it will be appreciated if you can visit Agbor and see these neglects yourself. I am not from Agbor but I recently visited Agbor, witnessed these neglects first-hand and am using this expose to bring them to your attention. His Excellency, Agbor town deserves your attention. Extending the 'Big Heart' ideology to the town will be celestial.